You can purchase this loose-leaf print reference to complement Revel™ for International Relations . This is an optional purchase. This companion text enables you to form a framework for analyzing the complex and constantly changing information that comprises our increasingly interconnected world. Opening your eyes to the positive and negative events that occur across the globe every day, authors Jon Pevehouse and Joshua Goldstein offer a strong foundation in current global affairs, with insight into topics like foreign assistance in the developing world, the changing nature of war, and global poverty levels. 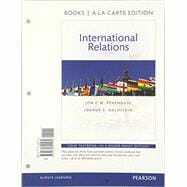 The Eleventh Edition explores international relationships from economic, social, and political standpoints. Through human scale stories that touch on broader subjects such as war and peace, humans and their environment, poverty and development, and more relatable material to help you understand international relations.